What If IBM Never Grows Again? Big Blue's stock price is so beaten down, investors buying today should do well regardless of whether the company returns to growth. Shares of International Business Machines (NYSE:IBM) have been beaten down during the past couple of years. The stock is down around 30% since hitting a peak in early 2013, and the market doesn't seem to be buying the company's turnaround plan. Revenue has been decreasing, mostly due to IBM selling off underperforming businesses and negative effects related to foreign exchange rates, and a per-share profit target set by the company in 2012 was abandoned late last year. IBM is transitioning its business to take advantage of growth areas -- what the company refers to as "strategic imperatives." While these businesses have been growing fast, expanding by 30% year over year during the second quarter on an adjusted basis, poor performance elsewhere is dragging down the company's results. IBM expects to report adjusted earnings between $15.75 and $16.50 per share this year, down from $16.53 per share during 2014, excluding discontinued operations. The market doesn't seem to believe that IBM will ever grow again -- IBM trades at just 9.25 times the low-end of its guidance range for EPS. What if the market's right? What if IBM never manages to return to earnings growth? It turns out that investors buying at current prices will do just fine. The worst case scenario for IBM is a prolonged earnings decline, so a no-growth scenario may seem optimistic to those who are extremely pessimistic regarding IBM's future. But let's imagine that IBM hits the low-end of its earnings guidance for this year, which would come out to about $15.5 billion of net income based on the current share count, and then flatlines for the foreseeable future. One thing to note: IBM's adjusted earnings, what it calls operating earnings, are not the same as typical non-GAAP earnings reported by other tech companies. While many companies add back stock-based compensation and other dubious items, IBM adjusts only for acquisition-related items, like the amortization of intangible assets, and retirement-related items. These are reasonable adjustments to make. 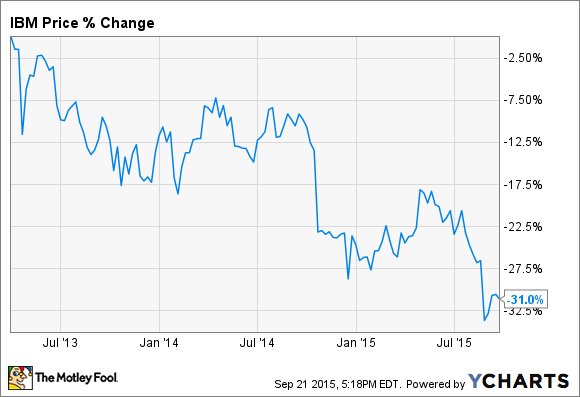 How would IBM's stock fare in this no-growth situation? We'll have to make a few assumptions. First, let's assume that IBM's P/E ratio of 9.25 remains constant. Second, let's assume that the total amount of cash IBM pays out in dividends each year, about $4.55 billion during the past 12 months, also remains constant. Third, let's assume the profits left over after dividend payments are used to buy back shares. As the share count is reduced, both the stock price and the per-share dividend payments will rise, in order to keep the P/E ratio and total dividend payments constant. What would happen during the next 10 years under this scenario? IBM would buy back a little more than half of its own shares, and EPS would more than double as a result. The stock price would reach about $320 per share for an annualized return, excluding the dividend, of 8.15%. Including the dividend payment, the annualized return would surpass 10%, and even higher if those dividends are reinvested. That's not bad for a company that's not growing. If IBM were to return to growth, not only would EPS expand even more, but the stock's multiple would likely expand, as well. Of course, if IBM can't maintain its current net income, this scenario goes out the window. But the fact that investors can get an above-average return on a company that's not growing is a testament to how cheap IBM stock has become. We can play with the numbers a little bit: If we assume that IBM earns just $12 billion per year in net income, instead of $15.5 billion, that still leads to an annualized return, including dividends, in excess of 7%. That's not a great return, but it's far from a catastrophe. There are no guarantees in the world of investing. IBM is going through a major transition, and it's hard to say when, or even if, the company will return to growth. But sometimes, shares of a good company become so cheap that the timing simply doesn't matter. IBM comes with a huge margin of safety, and it would take a disaster for investors buying at today's prices to get burned in the long run.